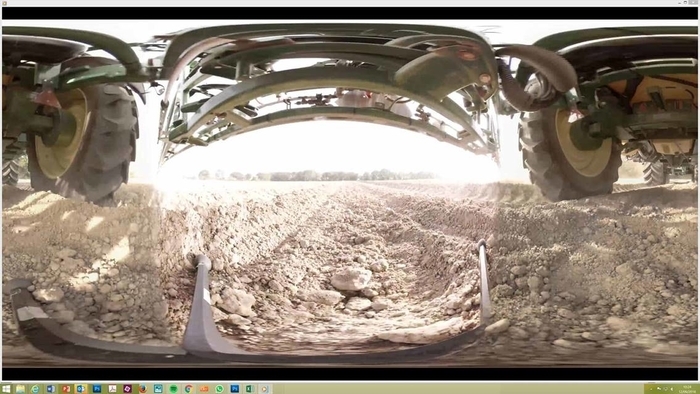 Introduced at Cereals 2018, the new video clearly demonstrates the potential of 90% Drift Reduction Nozzles to ensure pre-emergence sprays actually hit the intended target soil surface- and are not lost to drift. Further aerial drone, steady-cam and ground-hug camera technology lets operators see exactly what’s going on behind, in and under the spray boom – including the dramatic effect of sprayer speed and boom height on the risk of spray drift. With the benefit of 360° headset technology, the viewer gets a unique opportunity to experience what going on in the spray pattern. Mrs Wardle highlighted that drift risk is often greater with pre-emergence treatments because there is no crop to intercept and trap spray droplets. Mrs Wardle also pointed out that growers and operators have an obligation to minimise risk of drift to prevent spray movement into ecological areas or non-target crops, as well as protecting the future regulatory approval of important herbicide options. Controllable factors pinpointed to help operators minimise spray drift are a combination of forward speed, boom height and nozzle choice. Added to that, water volume is another operator-controlled variable where new Syngenta trials have shown improved efficacy for black-grass control. “The mantra for all operators to follow is Go Low; Go Slow; Get Covered,” she advised.